Published: April 27, 2011 at 09:51 p.m.
Poor Cleveland, even when you win, you are cursed. 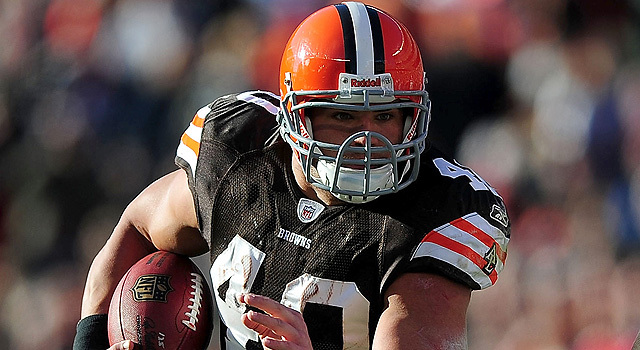 At least that is true for those who believe in the Madden curse, which many are convinced will strike Peyton Hillis, who was voted by fans Wednesday as the latest cover boy of the popular Madden franchise, beating out Michael Vick. And why shouldn't you believe? As Verbal Kent said in the "Usual Suspects", "I believe in God, and the only thing that scares me is the curse of Madden." Or something like that. It certainly seems possible for a town notorious for "The Shot" and "The Decision." When your heartbreak can be measured by "The [insert word of choice here]," you might be doomed. Even "Major League" was harsh to Cleveland. Seriously, you make a movie about the Indians in which the fantasy ending is just winning the division. Charlie Sheen as a pitcher is believable. The Indians winning the World Series? Not so much. Wesley Snipes scoring from second on a bunt is believable. An Indians pennant was too much make believe for Hollywood, though. I feel for my Cleveland brothers and sisters here. Because things have been worse for the Browns. And when you get down to it, if Hillis does fall victim to the Madden curse, it would not even crack the top six worst things to even happen to the team. The Browns trailed 14-12 in the 1980 AFC divisional playoffs but were challenging with just over a minute to play at the Raiders' 13-yard line. Quarterback Brian Sipe was instructed by coach Sam Rutigliano to throw the ball into Lake Erie if nobody was open. Instead he tried to force the ball into Ozzie Newsome. Rutigliano had to call 'red right 88' because kicker Don Cockroft had previously missed a pair of extra-point attempts. Browns coach Bill Belichick did the unthinkable in 1993. And no, it wasn't this head band. It was cutting quarterback Bernie Kosar. Not only did he release a Cleveland icon, but he made many Browns fans root for the Cowboys after Kosar came to the rescue of Troy Aikman, who was knocked out with a concussion during the 1993 NFC Championship Game. Kosar got his ring. Belichick got three in New England. But, hey, congrats on that whole Madden cover thing. Speaking of time travel, how many Browns fans would like to travel back in time to prevent Modell's parents from ever meeting? Probably all of them. Modell did the unthinkable when he fired Paul Brown (you know, the guy the team is named after). Modell then capped it off by moving the team to Baltimore. In other words, he was the worst thing to ever happen to Cleveland outside of the fire on the Cuyahoga River. Though, it wouldn't surprise me if he was responsible for that, too. Nobody can commiserate with losing a team more than I can. But at least the fans in Los Angeles were given closure because no team has returned. That can't be said for Cleveland, which not only had to endure the heartbreak of losing a team, but since its return seen it waste draft picks on Tim Couch, Courtney Brown, Gerard Warren, William Green, Kellen Winslow, Braylon Edwards, and Brady Quinn (among others). Cleveland doesn't deserve that. "Pick Six: Least desirable green-room guests..."